What Causes Permanent Eyeliner Fading? Permanent makeup is also known as micropigmentation, dermapigmentation, or in a simpler way, cosmetic tattooing. It is a technique that uses micro-needles to deposit pigment into the basal layer of the skin, the deepest layer of the epidermis. 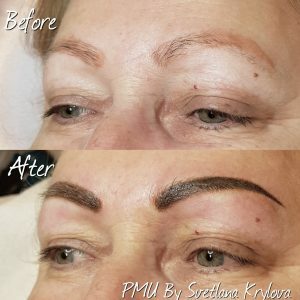 For permanent makeup procedure to be successful, permanent makeup artist requires the best digital permanent makeup machine that performs with less vibration, fine sterile needles, topical anesthetic, large variety of pigments and medical grade supplies like gloves, masks, wipes, cotton swabs, etc. 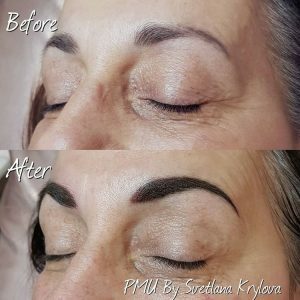 There are many new trends always coming up in permanent makeup, and usually, all permanent makeup artists are very quick to upgrade their skills according to the new techniques and tattooing guidelines. One of the most commonly-performed permanent makeup procedures, cosmetic tattooing is all the rage in the beauty industry right now. Cosmetic permanent makeup has gained so much popularity in the last few years that it can be performed on virtually any facial feature. These cosmetic permanent makeup procedures are meant to give clients a fresh, everyday, natural appearance; fantastic for a subtle makeup look. Permanent tattooing is not only limited to cosmetic purposes; in some cases, patients resort to permanent makeup artists to help them with medical conditions and disfigurations that affect the skin. Medical tattoos of this nature help to cover up any facial or bodily flaws. Camouflaging scars that are either natural or caused by burns, scratches, cuts, etc. Paramedical tattoo patients often report a soar in their confidence after receiving their treatment. It is a wonderful option for those who want to regain their self-esteem, especially after a long, hard battle with medical conditions they have no control over. At some point in their lives, many men and women begin to notice their hairline receding gradually over time. The reasons behind this are numerous: hereditary disposition, constantly wearing hats, and just a poor hair care regimen in general. However, those factors can be remedied with scalp micropigmentation. Scalp micropigmentation is the use of cosmetic permanent makeup to give the illusion of having a full head of hair. Getting a hair tattoo is considered a great treatment for a receding hairline, especially for people who lose their hair due to alopecia and premature baldness. In addition, scalp micropigmentation is a way to conceal scars from a previous hair transplant or surgery, as well as to make thinning hair appear thicker. How deep does permanent makeup go into the skin? Permanent makeup goes deeper into the skin than microblading does because of the different types of a needle it uses during the procedure. This quality is the main reason why makeup tattooing is permanent while microblading is not. Microblading uses a blade that creates superficial cuts into the skin known as micro-strokes and drives the pigment inside. Permanent makeup, on the other hand, uses a tattoo pen to inject the ink into the area. Permanent tattoo uses ink to treat the areas that need to be filled in, while microblading uses a temporary tint. With permanent makeup, touch-ups are barely necessary for the long run, and in the event they are, they are only required every 2-5 years. However, microblading pigment tends to fade over time which is why you need microblading touch-ups to the area every 11 months to 3 years at most. Bear in mind that there are plenty of factors that can affect how long permanent makeup lasts; for example, dry skin tends to hold pigment much longer than normal to oily skin. 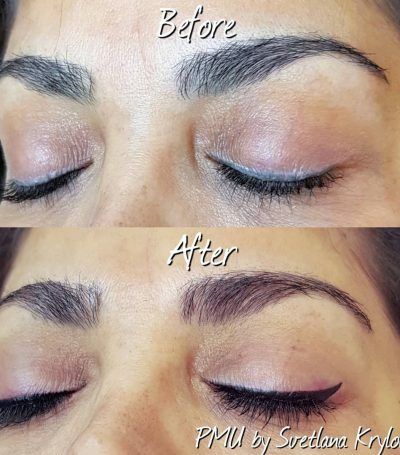 Permanent makeup is considered a lot more gentle than microblading, which makes permanent makeup a more suitable option for sensitive areas such as the lashlines and the eyelids. This means that many clients find permanent makeup pain a lot more tolerable than microblading pain. What is the difference between permanent makeup aftercare and microblading aftercare? On the other hand, permanent makeup aftercare is a much easier process. Although there will be inevitable redness, puffiness and scabbing until the area is fully healed, with the proper use of the right moisturisers and ointments, the permanent makeup healing process is generally a lot faster and less invasive than microblading. With microblading, scarring is an expected side effect in the healing process. In addition, microblading aftercare can be difficult and uncomfortable for sensitive skin types. We always hear the expression that says eyebrows are not twins; they are sisters. Well, with the latest permanent makeup technologies, your eyebrows can now be 100% symmetrical and perfectly suited for your face shape and bone structure. 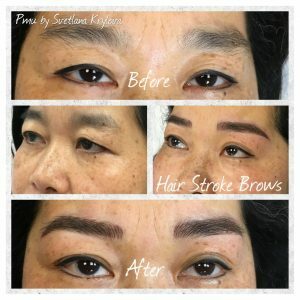 If you are tired of filling in your eyebrows every morning or have a hard time making them look identical, then you are the perfect candidate for permanent eyebrows. With permanent eyebrows, you no longer have to worry about accidentally smudging your brows or unintentionally wiping them off throughout the day. Permanent eyebrows guarantee your brows stay put and never go missing on you. This technique is usually recommended for anyone that wants a light, natural look to their eyebrows. Powdered eyebrows also maintain the warmthness and softness of natural brows in which gaps have been filled with an eyebrow pencil. The hair stroke technique is one that imitates the look of real brow hairs. Each hair is individually drawn to give some fullness to sparse brows. The hair stroke technique is suitable for those with dark hair so that the pigmentation in the hair strokes does not look too odd, too dark, or out of place. This method combines the powdered brow and the hair stroke techniques in one. The reason why it is 3D is that it gives the brows the warmth and the fullness they require. Although this technique is suitable for any client, it is ideal for those who have very minimal or very light hair in the eyebrow area. For example, for women with very light hair, 3D combination eyebrows will look fantastic on them seeing as it will heal properly and grant them the pigment they need. During a permanent brow procedure, the artist will make a preliminary drawing of the eyebrow shape in order to agree on the shape, color, and thickness of the eyebrows. This will give the client an idea of what their brows will eventually look like. The artist will make sure to suggest shape and color that will help bring out the client’s facial features and frame their face overall. It goes without saying that this basic drawing has to be approved by the client before moving on to the next step in any permanent makeup procedure; numbing the area. The artist will then apply a topical anesthetic cream and wait for it to kick in. Because of the way permanent eyeliner is performed to one eye at a time, the application of a numbing agent to the unoccupied eye will be regular all throughout the permanent makeup procedure. When the numbing has fully kicked in, the artist will begin the permanent tattooing procedure. The first thing to do here is to draw and then start filling in the entire brow after everything is approved by the client. The pigment is inserted to fill in the entire brow using a Round Micro NanoNeedle. The artist will pull the skin taut so that the needle is easily inserted and the ink is evenly and systematically distributed throughout the brow. 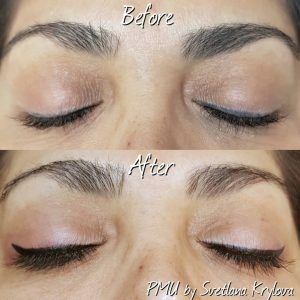 A good permanent makeup artist has to be extremely thorough in this step so that the needle does not permeate the skin too deeply and cause serious damage, pigment migration, or eye injuries. During this step, it is normal for some bleeding to occur as there is a needle puncturing the skin. There might also be some sensations of irritability and discomfort when the anesthetic begins to wear off, but keep in mind that this is completely normal. As soon as that happens, the artist will once more apply a topical numbing cream that is more potent than the initial one used as soon as the skin is broken. The final step the artist will administer in a permanent eyebrow procedure is cleaning and sanitising the area at hand. This is performed using baby wipes because they are non-invasive and also great to sanitise the area to evade potential infections. This step is where personal care is important. At this point, it is the client’s responsibility to take good care of their eyebrows so that they have the best possible results. Although permanent makeup is considered a swift and gentle procedure, it is normal for the skin to react to any kind of trauma. After the permanent brow procedure, the skin at and around eyebrow area will likely be red and swollen for a few days. The redness and swelling will subside around the third day after the procedure and subsequently followed by some scabbing; again, an expected stage in the healing process. The client should let the scabs come off naturally as using unnatural ways to get rid of eyebrow scabs might alter the pigmentation and the colour of the brows in the long run. Regular application of vitamins A and D ointment should help speed up the healing and aftercare process and prevent an infection from happening around the area. 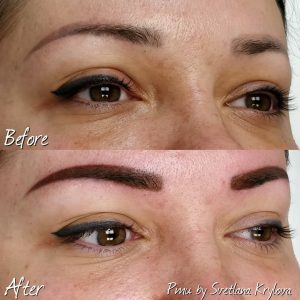 Although some clients might worry about scarring, with permanent makeup, a good artist will make sure not to puncture the skin too deeply so that no such scarring happens. Any kind of permanent makeup is a big commitment and it can be tricky to figure out which eyebrow colour and shape go best with your face. Along with what the client desires, the artist should pick the shape and colour that compliments the client and their facial structure. It is important that the end design of the eyebrow not only suits the client, but also has a very natural look to it. When it comes to choosing the colour of permanent eyebrows, there are many considerations to keep in mind. Although with permanent eyebrows most people are looking to add a pop of colour to their eyebrows, maybe fill in the gaps in their brows, you should keep in mind that, at the end of the day, you want your eyebrows to look natural. So not too light, not too dark is a good motto when picking out an eyebrow shade. How long does permanent eyebrow makeup take? How long do permanent eyebrows last for? Permanent eyebrows will last about 2 to 5 years, again, depending on the artist’s expertise and the client’s aftercare regimen. How often should I get permanent eyebrow touch-ups? Touch-ups for permanent eyebrows should be made after 4 weeks from the date of the procedure because, on average, it takes 28-30 days for the skin to go through a full cycle to heal and renew itself after an injury. Permanent eyeliner is one of the hottest trends in the permanent makeup industry today. Many people nowadays are looking to get permanent eyeliner done and for good reason. Ever since the cat eye made its comeback in recent years, eyeliner has been one the most popular makeup procedures since. For avid fans of the winged eye look, it can be difficult to perfect your eyeliner every single time you apply it. After all, if it is not hard enough to create the right design when you put eyeliner on, it is even more so attempting to replicate it on the other eye. This is exactly when permanent eyeliner comes in handy! With permanent eyeliner, you will no longer have to worry about dark smudges all over your eyes because you unknowingly rubbed your eyelid during the day. Permanent eyeliner, on the other hand, will not budge. Permanent eyeliner will allow you to get those few extra minutes of sleep in the morning because you will not need to be up early to achieve the perfect wing. With permanent eyeliner, you will be saving time and effort that you can channel into better ventures like a deeper sleep. Many eyeliner formulas available today, no matter how organic they claim to be, contain elements that may irritate your eyelids or even cause an allergic reaction. Permanent makeup, however, eliminates the discomfort of putting makeup on every morning and removing it every night. For those caught in a vicious cycle of snoozing their alarm every morning, dealing with makeup allergies on a frequent basis, or ending the day looking like a wild animal, give permanent eyeliner a try; it might just change your life. When it comes to choosing the eyeliner colour and design, there are many criteria you should keep in mind. In order to determine a final eye look, the client and the artist will work together to find the most suitable option. The shape of the eyes plays a major role in determining the final permanent eyeliner design. Although it seems like a small procedure that covers a tiny area, eyeliner can drastically change the look of the eyes. This is why it is important to study the initial eye shape so that you choose the most appropriate permanent eyeliner style that will enhance your eyes. Almond eyes usually require a very thin line that starts from the inner corner and thickens as it moves towards the outer. This technique will undoubtedly bring out the natural beauty of almond-shaped eyes. Hooded eyes need a thick and bold winged look because it will make them stand out and seem bigger. Downturned eyes will necessitate a more pronounced lift in permanent eyeliner positioning. The eyeliner should be drawn on a bit higher starting at the inner corner and progresses with a 45°-angle lift as the pigment nears the centre of the lash line. The slant of the design will create the illusion that your eyes are larger and more lifted than they actually are. For upturned eyes, a permanent lining of the upper and lower lash line will help even out the shape of the eyes and make them look symmetrical. For round eyes, on the other hand, a cat-eye is the perfect style of eyeliner to use. It will help elongate round eyes and make them appear more balanced. Small eyes require very thin eyeliner, preferably in lighter colours, so white, beige, or light brown are perfect options in this case. It is also recommended that you undergo a lash enhancement procedure because that helps open up small eyes and make them appear bigger than they are. If you are undecided about what colour eyeliner best suits your eyes, simply look at the colour wheel and it ought to help you determine. 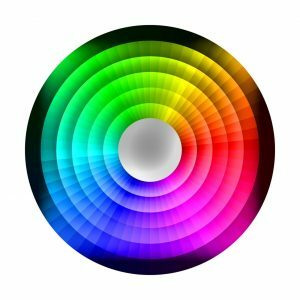 According to colour theory, you should choose the colour of your eyeliner based on the colour that appears at the opposite end of the colour wheel. For example, green sits right across red, which means, scientifically speaking, red and green make a compatible pair of colours. So, if you have green eyes, the most suitable eyeliner colour design is red, or more realistically, a shade of it. So instead of red, you can opt for a shade of brown because those colours look more natural and bring warmth to the eyes. Although you can have any permanent eyeliner colour, most clients usually go for a classic true black eyeliner; black is timeless, looks great on everyone, and goes with every look. In addition, black is the colour that will last the longest compared to other permanent eyeliner shades and colours. For permanent eyeliner, the artist will use an acupuncture needle. This needle is thin and does not create a lot of trauma to the skin, especially in a sensitive area such as the eyelid. In case the client wishes to have a lash enhancement procedure along with the permanent eyeliner, the eyeliner should be very precise, thin, and focused primarily on the lash line. The permanent makeup artist will proceed to draw a rough outline of the permanent eyeliner style that the customer has already approved. The artist will then use this outline as a guide to help them create the perfect eye-look. The artist will start filling in the outline they created with the pigment they agreed on with the client. The pigments used in permanent eyeliner are usually harmless and do not pose any risk to the eyes whatsoever. They are made of natural ingredients and do not contain any animal products so you can rest assured your eyelids will not have an allergic reaction when the procedure is over. In this step, the permanent makeup artist will have to be very cautious and careful because of how fragile the eyelids are. As soon as the permanent eyeliner has been injected into the skin, the artist should sterilise the area. They will use saline drops to disinfect and clean the eyelids from any pigment that may have gotten in during the procedure. The artist will then apply a topical antibiotic to the eyelids that will help speed up the healing process. All in all, a gentle permanent makeup artist will need an average of 2.5-3 hours to finish permanent eyeliner application because it is a very meticulous procedure. The permanent eyeliner procedure is ideally noninvasive, which means you will be experiencing minimal bruising or scabbing afterward. There could, however, be some redness and puffiness around the area, but that is perfectly normal. The redness and puffiness are minimal and should subside within the following few days. Keep the area dry: After you have had your permanent eyeliner, for the next three days, you should keep the eyeliner area away from sources of moisture. Wash your face with extreme care, avoiding contact with the eyes. Also, try to wash your hair right before you come in for your permanent eyeliner appointment because you should not take showers and it is not recommended to wash your hair for 3 days after your permanent eyeliner procedure. A and D vitamin creams: Creams, topical antibiotics, and ointments that contain vitamins A and D are perfect for permanent eyeliner aftercare. They help speed up the healing process and depuff the eyelids. Avoid coconut oil: Coconut oil is a fan favourite, but it is definitely one to avoid when getting permanent eyeliner. Not only does coconut oil clog pores, but it also slows down the healing process. Wearing makeup on top of the permanent eyeliner: If you like to wear eyeshadow on top of your eyeliner, the chances of having your permanent eyeliner fade are a lot higher. The reason why is not because of the eyeshadow itself, rather wiping it away with cosmetic wipes and eye makeup removers at the end of the day. The constant rubbing around the eyeliner area is what causes the eyeliner colour to lighten over time. Using eye creams: Many people put eye creams or eye lotions mainly for wrinkle and aging prevention purposes. Although this is a good method to reverse the effects of time on the skin, it can be detrimental to your permanent eyeliner. The thing about eye creams and eye lotions that makes them a hazard to permanent eyeliner is the fact they contain exfoliating agents. These exfoliating agents aim to rejuvenate the skin by speeding up the process of building new skin cells. Obviously, this will cause your permanent eyeliner to fade faster than it should as it removes the top layers of the skin where the permanent eyeliner pigment is mostly concentrated. Exposure to the sun: For those who wish their skin to hold on to permanent eyeliner pigment, sun exposure is something to avoid. In this case, permanent makeup artists advise you to always wear sunglasses that fully cover the eye area. A fading pigment is one of the most common permanent eyeliner problems. This is why it is important to pay attention to elements that can cause the colour and the eyeliner pigment to become washed out. In worst case scenarios where your permanent eyeliner does fade, a rough trace of the eyeliner outline will remain. 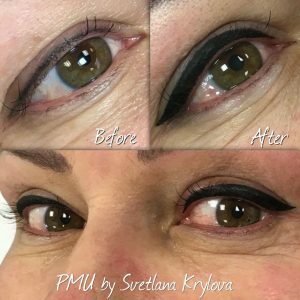 So, next time you get a permanent eyeliner procedure, it will be much faster and easier since the initial design is already there and the permanent makeup artist simply has to fill it in. Can I get permanent eyeliner removal? In the event you do not like your permanent eyeliner results or want to have it removed, permanent makeup artists recommend you simply wait for it to fade on its own. You can have laser treatments to remove your permanent eyeliner although it is not the best way to get rid of it. The eye is a sensitive area and you should treat it with caution and care. Although permanent eyeliner is not a painful procedure to get, it can be uncomfortable just like any other permanent makeup procedure. The degree of discomfort, however, depends on the patient’s pain tolerance, of course, as well as the potency of the numbing agent the artist uses. Permanent eyeliner can last anywhere from 2 to 5 years depending on the skill of the artist, aftercare of the client, and their skin type. How often do I need permanent eyeliner touch-ups? Permanent eyeliner touch-ups are done anytime after 4-6 weeks because that is the amount of time it takes for the skin to heal and fully absorb the pigment. What should I do in case of permanent eyeliner infection? If your eyes get infected you should contact a healthcare professional for immediate help. Afterward, you must contact your permanent makeup artist and let them know what has happened as you can possibly have an allergic reaction to the pigment or an aftercare ointment. Getting permanent eyeliner is a big step. You do not want to go under the permanent makeup pen if you are not 100% certain about it. It is also crucial that you do your homework to find the best permanent makeup artist in your area. This will help you eliminate possible damage and have great results overall. Tired of having lip smudges on your wine glass or coffee mugs? 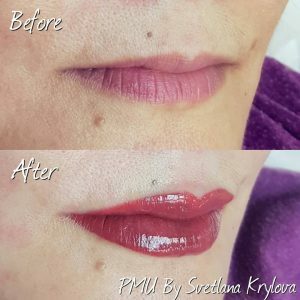 If yes, permanent lip makeup is for you! But if you simply want your lips to look fuller or more symmetrical without getting lip fillers, consider permanent makeup for the lips. 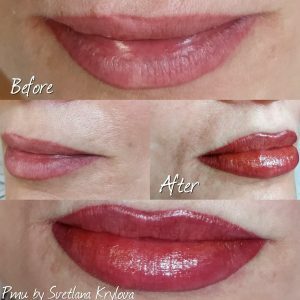 However, if you are a client with mature skin, you can also get your lips done permanently to restore the natural contour of your lips and to stop your lipstick from bleeding into fine lines around the lips area. When picking the right design and colour, you should consider if the lips are even and if you want to make them the same fullness and create the perfect lips. Since our features are never perfectly symmetrical, we need to create lips as symmetrical as possible without making them look overly big or overdone. As for colour, many want a natural tone that makes it seem as if they were born with beautiful plump lips. Some clients are not as lucky and would like to make their lips a little more pink rather than beige. Natural pink pigments can be used for that. There are some clients that always wear red lipstick and want a red lip and for that, we will require a darker red as the darker colour will always fade into light red. For intensity, we use darker and brighter pigments. A touch-up session is usually required to perfect the intensity of the colour. For example, if you use dark red, it will become light red, while magenta will turn light pink and purple will heal more like lavender or light pink depending on what tint is the strongest. Light pigments will heal even lighter. Consider the colour of the skin of the client and their veins because if the veins are blue, it means that the colour will heal into a cooler tone and might need a bit of a warmer pigment for a natural look. Green veins usually mean warmer complexion and they can also have warmer pigments as they will compliment them more than the colder pigments. Colder pigments can be worn by warmer complexions, as well, but warmer colours look more natural on them. contour is lost or you want a more pronounced cupid’s bow, we have to recreate it during the drawing process. 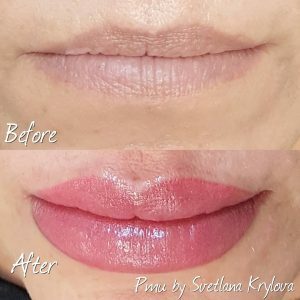 Also if the client wants fuller lips, we can go over on the skin, but that will certainly require a touch-up session as the skin is a completely different colour than the lip and needs more time in order for it to look right. We work on one lip at a time. If the top lip has a bit of discolouration or has a different colour altogether, we will have to colour-correct it first before applying the colour of choice. There are many pigments to choose from! Because lips have very thin skin and are very vascular, it is possible to experience a bit of redness and some bleeding. Sometimes even bruising can happen but all this will subside within a few days. As with other procedures, you will experience some swelling and will develop scabs which are a normal part of the healing process. The client should follow an aftercare regimen for better healing results. How to choose a proper pigment? Everyone’s pigment after it will heal will look different on them especially if they have different skin colour and colour in their veins. This should be considered as it is very important when choosing the pigment. Looking at the veins can also be done when choosing pigment for brows as well as this can help you determine if you should go for a more warmer rather than colder pigment. How long does a permanent lips makeup procedure last? The procedure lasts about 2.5 -3 hours long as a permanent makeup artist needs to make sure that the pigment that was chosen looks even and everything looks flawless. It takes the lips 4-6 weeks to heal and to see the real pigment that will stay. How long does permanent makeup for lips stays on? 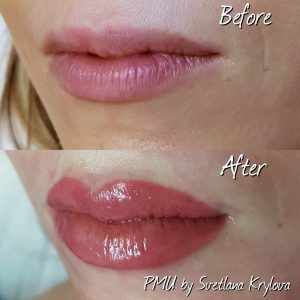 Permanent lip lasts anywhere from 2-5 years depending on the skill of the artist, healing and the aftercare of the client. After the scabs come off naturally, the client should use lip balm with a sunscreen to protect their lips and their pigment. When should I get a permanent lip makeup touch-up? Permanent lip touch-ups will be done after 4-6 weeks after everything is healed and you can see the true pigment. Very few people in the world have faces that are exactly symmetrical, while most people don’t. This is where permanent makeup comes in handy. Permanent makeup procedures can be used to achieve facial symmetry. For example, if you have an eyebrow arch slightly higher or lower than the other, brow permanent makeup can fix the problem. This is because any permanent makeup procedure is usually done with accurate measurements. In addition to brows, many people are born with naturally uneven lips. It’s usually a small imperfection, but in some cases, it’s severe and noticeable. Permanent makeup is perfect for evening out the lips and making sure they’re perfectly symmetrical. Furthermore, some people have natural birth marks where they suffer from either hyperpigmentation or hypopigmentation. As a result, the colour contrast between that area and skin tone is too stark. This is an issue permanent makeup can easily solve. The wonderful thing about using permanent makeup to fix your asymmetrical features is that it gives you the confidence boost that you need. There’s no point in living with a feature you’re insecure about as long as the solution is as easy, simple, safe, and reliable as permanent makeup correction. Permanent makeup is a straight-forward procedure that’s usually safe and successful. However, corrections are sometimes necessary if you don’t seek the right permanent makeup artist. In this scenario, a permanent makeup correction is necessary. Many clients reach out to a permanent makeup specialist after receiving a bad procedure. If the permanent makeup artist isn’t skilled enough, they could very easily ruin the client’s appearance. Not to worry, though; cases of botched permanent makeup are more common than you think, and so is fixing them. For example, if the PMU uses an incorrect shade or a colour that’s too dark for eyebrows, they end up looking unnatural. Other times, the pigmentation in the ink can turn into an unwanted colour, such as green or teal. For this, the permanent makeup artist has to use a colour corrector to reverse the damage and restore the brows to a more natural colour. On the other hand, if the damage to the area is too severe, it’s simply best to wait until the pigmentation has completely faded. You don’t want to add more colour to an area that is already too dark or infected. To avoid major harm or injury during and after your permanent makeup procedure, do your homework and look for a skilled permanent makeup artist in your area. The best way to ensure top results is to find a PMU that you trust and feel comfortable with. Hi! Upper eyeliner is $350 and Upper Eyelash Enhancement is $300. 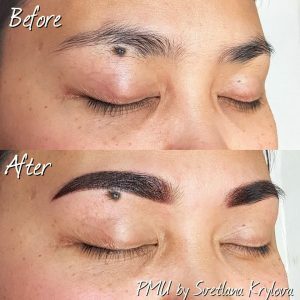 You can view the full price list as well as our current great promotions over here https://skinnovationsmedspa.com/permanent-makeup-prices-promotions/.